Laura Worthington is an accomplished typeface and lettering designer and experienced graphic design practitioner based in Seattle, USA. She has received numerous awards and accolades regarding her extensive range of script faces. Her work has been listed nearly every year with nearly every Foundry’s ‘Best of’ including: MyFonts, FontHaus, Ascender, and even Typographica. 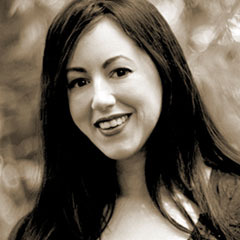 She has twice received Awards of Excellence from Communication Arts, has been featured in Hand to Type and Slanted, and been featured in MyFonts Creative Characters, CreativePro.com, and Computer Arts Magazine. For the past five years, Laura has taught on the Visual Communications program at Highline Community College, in Des Moines, Washington. Type Camp provides a one-on-one, customized, and direct learning experience. Books can't answer that burning question you can't find the answer to, videos can't tell you if you're holding the brush right and why your strokes look wonky, and a large classroom doesn't provide focused learning opportunities. At Type Camp, you walk away with knowledge and experience learned by having fun during the process, making friends, and opening up your world in ways you have never imagined. Pizza – any kind will do! Burgers – I’m not picky about that either. Junk food in general works for me. Except hot dogs – ewww! Typography, calligraphy and lettering. These are the books I collect like a fiend. Also non-fiction: particularly bios and memoirs and anything that covers an interesting time in history. Beer – the strong, bitter, hoppy types of beer – IPAs, Reds, Belgians and so on. When it’s too early to drink beer, I’ll settle on a white chocolate mocha and Pepsi Max. Kubrick, Hitchcock, Lynch, independent and foreign films, horror, drama and anything with a good story and dialogue and especially anything with a touch of the bizarre. For TV, I am a total teenager – South Park, Family Guy & The Simpsons. But the rarely found mature side of me likes Investigation Discovery, the History Channel, Discovery, Bio and the Military Channel. I would love to do more of it and although I love flying, getting through the airport and onto the plane stresses me out. Books about type, lettering and calligraphy, I have every Letter Arts Review dating back to the mid 1980s, vintage fountain pens and handmade notebooks & journals. Also, butterflies, insects, skulls and bones. I studied scientific illustration for some time and I find these things to be fascinating. Anything my dad has made – he is a retired engineer and makes all kinds of interesting contraptions, most recently a machine to test the laws of gravity. Everything he invents/makes is pretty cool. Except that one time when he rigged our TV set to only work when you had the key to it. Not cool. Where do I begin? I love plants of all kinds. I used to work in a greenhouse! And I have a ton of them and keep adding to the collection every spring. My home is turning into a jungle! Dogs. I have two of them and I volunteer at the Humane Society and have fostered dogs as well. Designing display fonts and drawing letters.